...and of course, many other questions. In short, what we need is a common understanding on how fans work, the physics of the process, and therefore a method of agreeing on how to solve problems, make adjustments and so on. As you make all know, there was an important paper published by Klaus Scharnhorst in 2005 which is available by google-ing "scharnhorst ducted fan". This paper is well worth a read, despite containing a number of equations, some physics, and a little germanic english. The paper is a rewrite of some articles which appeared in various model mags earlier, going back to an MFI article of 1984 (!) in which he derived a famous equation for the velocity of air exiting from a coming out of a static fan (i.e. one strapped to the bench). This is important because it is a value which can be measured, and therefore theory can be checked against observation. This can then be related to the values the theory predicts for the performance of the fan in the moving model (which is harder to measure). The net of it is that given the geometry of the model (ducts, fans, etc) which doesn't change, and a few other bits of information (such as the speed of the model - hard to know) we can work out how much power is needed, and therefore what motor, battery is required -- surely a useful aim! I've used this method to verify the performance of my West Wing Bae Hawk, and can confirm that the theory does correspond to the measurements with a fair degree of accuracy. I'll post a summary of the experiment shortly. For those interested, here is a brief summary of the Scharnhorst paper (you'll have to read the whole thing to get the full reasoning, but I'll precis it here for reference and refer to it as KS ). 1. The inlet area is Ai and air enters this with velocity vi (the speed of the model), The volume of air passing through this in unit time is Qi = Ai * vi. Note: area is measured in sq metres, or m^2, and velocity in m/sec. 2. the air entering must exit. Since there is no combustion, or temperature change, involved we can assume that air in incompressible, so the volume of air exiting in unit time is Qe = Ae * ve where Ae is the exit area and ve is the exit velocity. So, Qe = Qi by our assumption. Volume is measured in m^3. 3. The mass of air being moved is M = Qi * rho where rho is the density of air (about 1.2Kg/m^3). Mass flow is measured in kg/sec. 4. The speed up of the air produced by the fan is dv = ve - vi. The thrust produced is T = M * dv. Thrust is measured in Newtons. The power needed for flight at this speed is Pflight = T * vi measured in watts. 5. (this bit may be unfamiliar to a number of modellers, please hold onto your seat). The impulse gain by the system because of the input of flowing air is Pgain = (1/2) * M * vi^2 measured in watts. The impulse loss to the system by ejecting flowing air is Ploss = (1/2)* M * ve^2 also in watts. So the power produced by the system (due to the fan working away inside) is Pfan = Pgain - Ploss measured in watts. 6. The "efficiency" of the fan is the nearness to which the energy required is matched by the energy provided, or Efficiency = Pflight / Pfan. As a percentage this is usually around 80%. The Power required from the motor, Pmot, also depends on the losses in the system due to friction in the duct, restrictions in the geometry of the duct and so on. KS assumes (from an analysis of pipe flow theory, etc) that Pmot = Pfan/0.85 is a reasonable approximation. This needs more exploration IMHO. So (sorry if this is lot to digest) we have a theory which requires ONLY the size of the entry and exits, AND the speed of the model in level flight, to determine the likely power consumption of the motor -- quite an achievement, I think you'll agree ? In a moment I'll post the figures I've got for my Hawk. Why just EDF ? what about us Glow engined D/Fan flyers? Observed vs calculated figures for my West WIngs Bae Hawk. The area of the inlet is 3667 mm^2 and the outlet is 2463 mm^2. But what is the speed ? 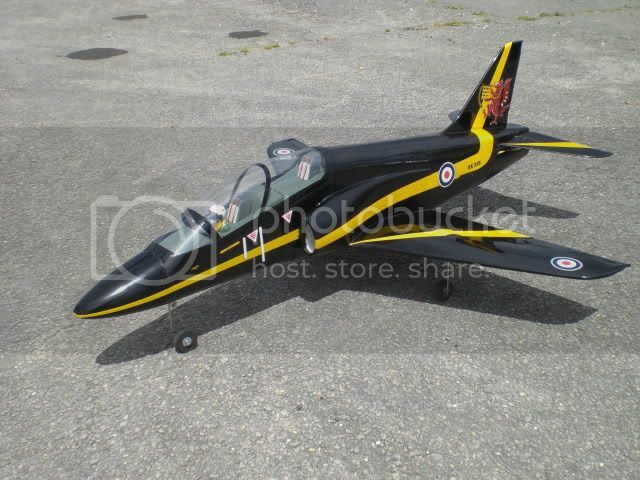 It is much faster than my scale Tucano (which flies around 60mph) , but not as fast as a pylon racer at around 180mph. This is a difficulty (which I plan to fix by fitting an Eagle Tree logger measuring airspeed in the next flight). For the moment let's assume it could be 46m/sec. Then, Q = 0.17 m^3 and M = 0.21 kg/sec. Thrust T = 4.6 Newtons and Pmot = 313 watts. Actual consumption as measured by battery depletion is 350 watts, the difference going in making the ESC hot, the motor hot, the battery hot, etc, So, some measure of agreement there ? Note that these are NOT the figures for static thrust and consumption as obtained on the bench. The whole problem of understanding the STATIC thrust is also analysed by KS, and I could precis that too, if there is interest ? The important point is that we can EASILY measure static thrust, but we cannot easily measure dynamic thrust. Yet dynamic thrust is what we want to know, since that determines model performance. What we need is to calculate dynamic thrust from static thrust, and this KS does. great. I think the comparison of turbines and ducted fans should raise some interesting discussion. ok, i.c. ducted fans should have their day in court too. I just get the feeling that most people in that community have moved either to EDF or to turbines -- is this right? Understanding EDF would be a good start. 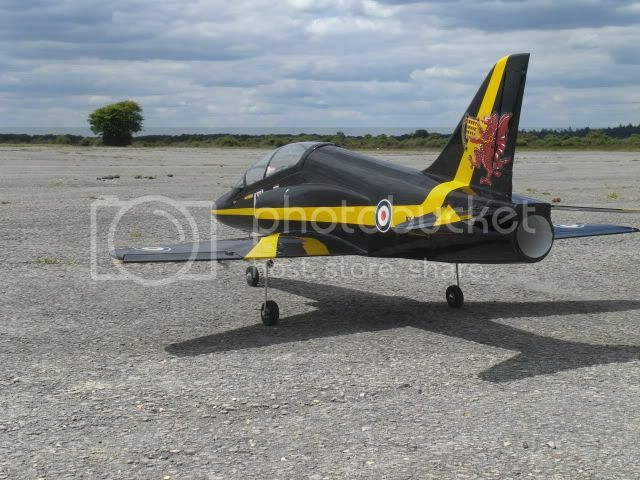 Just for interest, and to lighten the mood a bit, here are some pictures of my Hawk which flew again today in 14mph wind. We collected some airspeed, ve , data as I'll show in minute. 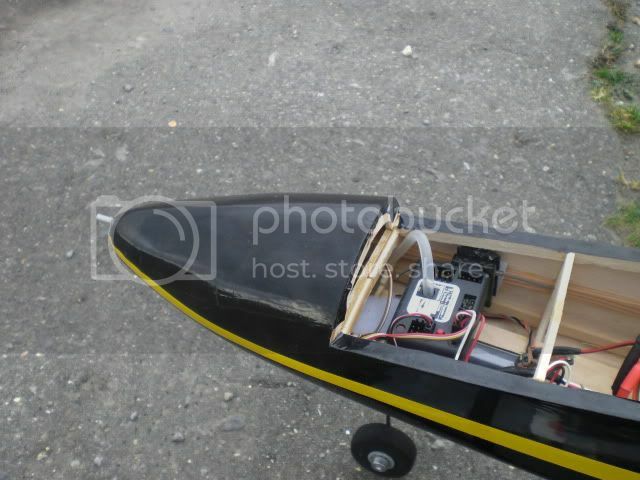 First, here is a general view of the plane as built from the kit - flies really well on a 4S 2600Mah 60C lipo. I uses a Wemotec mini fan with a Mega16EDF motor, Spectrum 8 radio, and E-FLite electric retracts. Notice the relatively small inlet ducts, but they are 107% of fan-swept-area. To find out how fast the Hawk flies I fitted an EagleTree logger, programmed to record airspeed as sensed by a pitot tube. First job was to fit the equipment as shown in the picture. Fortunately there is masses of room in the from as the battery is located further back, quite near the CG. The logger is sitting in the payload bay, on top of the noseleg retract unit, as it happens. The tube connects through to the aluminium tube seen projecting out of the front of the nose on the left to give a dynamic air pressure sensor in clean air. The static air pressure port is inside the logger, but care must be taken to ensure that the fuselage is enclosed, as draft inside the body could affect the pressure reading. Too bad about cooling for the battery/ESC, but that doesn't seem to be a problem at present. The measured airspeed varies quite a lot depending on the behaviour of the model, and as one naturally flies in large horizontal figure-of-8 patterns the speed (and altitude) does vary quite a bit. air flow Q = 0.15 m^3 and M = 0.19 kg/sec. Thrust T = 3.9 Newtons and Pmot = 238 watts. So, how do we account the discrepancy? Or, in common language, "where are all the watts going?" I will attempt to do what I always do when confronted with a problem to make the solution maybe easier to come by . (never mind the maths etc for a moment even though it's relevant ). OK Lets start with a EDF unit on its own .Bags of thrust just like a normal prop on an engine .Now then ,Add an inlet duct and an exhaust tube outlet .The thrust diminishes a lot (friction /air turbulence /boundary layer effects throughout the mechanism) .So you might ask ,what do you do ? You can't seperate the inlet flow from the outlet to keep the velocities /pressures seperate apart from a brick wall.of infinite size between the two.It's nothing like a gas turbine engine where the thrust is produced by a multi internal expansion of gases syndrome . In other words "What goes in comes out".It's only air in our case! I have an Eze Fan Nigel Hawes design --No inlet nor outlet tubes whatever . It has virtually no inlet nor outlet bits in the way of the airflow .The thrust is obviously less than perfect but I can't feel any discernible difference from my fan whether in or out of the model. The link to the Scharnhorst article does not work for me! 15 articles Duff link...Ive removed it. Richard, it's hard to tell from the picture as it's taken from the rear but, is the pitot tube far enough away from the nose of the aircraft? You will have a substantial pressure wave building up in front of the the nose that could affect the readings. how far into the airflow do you think the pitot should project ? How far would the pressure wave extend? suppose this would have the effect of registering a low value ? In the past I have usually mounted pitots on the leading edge of the wing, but that proved too difficult in this application. I recall the Eagle Tree documentation saying it should project about 1/2 inch which it is. apologies, the link was the one given by Google, but it is for a PDF download and obviously has not copied correctly. I have posted the paper on our own web site, where it is under "designing". Perhaps you can try this url I know it works because I've just tested it. ....never mind the maths...........EDF....Bags of thrust...........Add an inlet duct... "What goes in comes out".It's only air.....I can't feel any discernible difference from my fan whether in or out of the model. Myron, well, quite a few points here ! I think most people know that EDF works by making a draught at the back of the plane and hoping it pushes something forward, so I didn't mention it. The real question is how many watts does it take to create a decent draught? what motor do I need to put in to achieve that? what battery will satisfy the cravings of a thirsty motor? If I enlarge the openings will it help or hurt ? and so on. For this we need some science. On the question of the Ezefan (I've built and flown two) there is no duct front or rear as you just have the fan unit mounted on a vertical plate forming the fuselage (a clever idea) - so it's hardly surprising if the fan unit on its own, or the fan unit in the plane have the same effect? Actually I think a small exit duct would do wonders to improve the thrust of the raw fan unit. A yoghurt pot turned into a tapering tube should do it! There is another, deeper, question. Since an EDF unit is just a cylinder (with a motor and propellor inside it) why does it work at all? Since I am currently venturing into EDF for the first time, with a very simple 4 fan scale Vulcan, and as a science teacher, this thread should be right up my street. But I must be honest- ignorance is bliss!! (beyond working out my intake/outlet values). Andy, your FIRST project is a 4 FAN VULCAN ...? I can only gasp! Courageous, or what? Why not play around with an EZEfan just to get going ? Just a thought ! I started this thread to give some exposure to the basic physics of EDF, as it's been known about for about 20 years now, but apparently not widely disseminated, at least in the UK. If there are topics you think are relevant I hope you'll raise them. ** the analysis of the static operation of EDF, i.e. when vi=0. The calculation of ve when vi=0 led to the famous equation first published in 1982. It's important because it is one of the few parameters that can actually be measured on the bench. ** The effect of ducts, and how to design them. Generally speaking, ducts only make things worse, but we can aim for the least worst outcome. ** the relationship between thrust and power. The modellers ruin : "just apply more power -- in the end only more power helps", but that means bigger motors, heavier batteries, and so on. Richard, without knowing the scale of the hawk you are using it would be hard to say but I would go for a scale size probe, I'm not sure 1/2" would be scale on your model, it may be too short? I only build what I want to see flying Richard. If that means I spend most of my time out of my depth (and it does) well that just adds to the fun! I wanted to build a vulcan- there are plenty of pusher prop versions- but I know that's not right.